PUTRAJAYA, 16 Okt 2012 – The National University of Malaysia Medical Centre (UKMMC) has been chosen as of the the hospitals to provide schooling facilities to school students admitted to hospitals. Implemented under the ‘Hati Nurani’ projek of the Ministry of Education as suggested by Puan Seri Norainee Abdul Rahman, wife of the Deputy Prime Minister, Tan Sri Muhyiddin Yassin, the ‘School in Hospital’ (SiH) programme aims at ensuring shool children admitted into hospitals will not be left behind in their education. UKMMC is one of the four pioneer hospitals selected under the programme. A Memorandum of Understanding to implement the programme was signed here last Friday (Oct 12) between the Ministry of Education, UKMMC and Yaqueen Foundation at the Shangrila Hotel here. 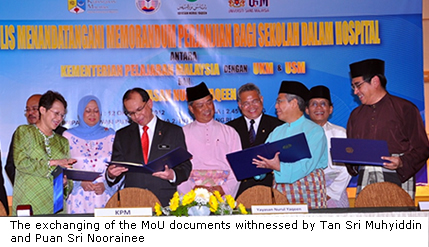 It was signed by Secretary General of the Ministry of Education, Datuk Dr Rosli Mohamed; Vice chancellor of UKM, Profesor Tan Sri Dato’ Wira Dr Sharifah Hapsah Syed Hasan Shahabudin and Datuk Dr Ismail Ibrahim, a member of the Board of Trustees of the Yaqueen Foundation. Tan Sri Muhyiddin who is also the Minister of Education who witnessed the signing said since its implementation a total of 6,550 students had benefitted from it sitting for their Primary Assessment Examinations (UPSR), Lower Secondary School Assessment Exams (PMR) and the Malaysian Certificate of Education Exams (SPM). He asked the Ministry to assess the programme especially results achieved by students sitting for the three exams from their hospital beds in the four hospitals. Another three hospitals, the Sultanah Aminah Hospital in Johor Bahru, the Sultan Ahmad Shah Hospital in Temerloh and the University Science Malaysia Hospital in Kubang Kerian, Kelantan are slated to be brought under the programme. Puan Sri Noorainee, patron of the ‘Hati Nurani’ project; Senate President, Tan Sri Abu Zahar Ujang; Deputy Minister of Education, Datuk Dr Ir Wee Ka Siong; Director General of Education, Tan Sri Abdul Ghafar Mahmud and Prof Dr Zarina Abdul Latif, Head of Pediatric Department, UKMMC attended the signing ceremony.